Born and raised in Cuba, Ivan Aleman has always, since a child, had a passion for art. To further his knowledge and skills he attended the Fine Arts Academy for 5 years, this took his creativity and skills to a whole new level. In 2011 Ivan made the transition from drawing and painting on canvases to permanent art on skin with tattooing. He mentored under Leo Canossa, a very well known tattoo and sought out artist in Cuba. During Ivan’s mentoring he learned his style and technique with tattooing. Ivan made his mark bringing realism (his favorite style), creativity, and amazing flow with every unique piece he tattooed. 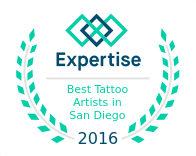 Tattooing is illegal in Cuba, Ivan made the decision with his wife to leave everything, family, friends, home, and the only life he knew to follow his dream and passion for tattooing to the United States and make his tattooing dream a reality today in San Diego California. When Ivan’s not tattooing he’s drawing and painting none stop, driven with passion and goals, learning more about art daily, pushing himself with no limits, truly an inspiration, creating tattoos for his customers with an experience that leaves a meaningful mark in their lives permanently. To schedule a consultation or tattoo appointment with Ivan, please call the shop or use the website contact form and our scheduling manager will get you set up with an appointment.